This is an unsupported ride. There is no sag wagon. If you need to leave the ride for any reason, you will either need to make it to a train station (not many after you cross the Hawkesbury), or call a taxi (or a very kind friend). We encourage riders to help each other. If you see someone in distress, offer to lend a hand. There are 2 free coffee-and-cake stops: Mt White and Budgewoi. They are both by the side of the road. The other popular place to stop for food is the 24-hour McDonalds in Gosford. Even with these tea stops you will still need to be carrying snacks and water. Compliance will be inspected at event check-in. This year’s ride will be held on Saturday November 17. It’s not a full moon (the car racing in Newcastle unfortunately falls on the full moon weekend and we’re trying to avoid that). So bring good lights. The Audax registration page will be up soon. And so it’s done again for another year: a whole lot of people riding an awful long way and having a rather nice time. With a little over 200 riders (including some very last minute registrations, tut tut…), we were treated to a beautiful warm evening with a gently southerly tail wind. Massive thanks to our tea Stop Volunteers at Mt White: Mike, Natti and Naomi. And at Budgewoi: Victoria, Prue (who also snapped some of these great photos) and Benjamin. These guys give up a whole night of sleep and miss the joys of the night riding to keep folks fed and watered and we couldn’t have run the event without them. Riders often express that this is one of their favourite aspects of the event and how much it help them get through the dark hours. This year at least three struggling riders were given lifts by our courteous tea stop crew, which is truly going above and beyond. Thanks to the Audax Club of Australia for supporting and insuring our ride. If you have gotten the long distance riding bug, check out their rides calendar as they have rides on throughout the year. Thanks to Dieter at York Lane Bar, not only did he work furiously in the kitchen to make sure folks got fed but then he jumped on the bike and joined us for the ride as well. It’s marvellous to be able to start the event and do registrations at York Lane and we appreciate the support. Also massive thanks to our prize sponsors. Anyway, some bright spark early finishers started a pile of cards, and it was from this pile that Maisey from Ghost Gum Bikes and Kerry from K-Lite drew at random around 8am. The winner was Rachel Hayden who was extremely excited to take home a set of Bikepacker Pro 1,200Lm dynamo lights. This is always a hotly contested category and this year was no exception. Amanda Cleif (who won last year for riding a fat bike) on a rather lovely vintage road bike complete with wicker basket, tea set and croissants packed for the morning. This is not exactly wrong, in fact it’s almost spot on perfect, but it needed a special mention somewhere. Bart riding the “Omafiets snack wagon” an Omnium cargo bike with a mailbox full of chips on the front. But really, anyone who saw these guys riding knew they had this prize in the bag, and so the award for most inappropriate bike has to go to “Team Reddy-go”. These bikes, for the uninitiated, are rather heavy, use solid rubber tires (drastically increased rolling resistance), have only three speeds, and a limit range of seat adjustability. In all honesty they make riding across town a bigger challenge than usual, and so riding 180km on one of these bikes can only be regarded as herculean. Top marks to Jason, Justin and Jose. Jose gets a particular mention as his longest ride previously was in the order of 30-40km., what a step up! These guys win a $100 voucher for Ortlieb, Velo Orange, Abus or Basil accessories at Metro Cycles in Newcastle and also a voucher for an in house service at Wheely Convenient HQ in Darlinghurst. This either the easiest or the hardest prize to win depending on your perspective. We would suggest its the hardest, as even riding slowly, simply being on the bike for 13+ hours is a massive effort. Kai was actually nominated for the Camaraderie award by several people. But the very great lengths he went to to ensure other riders were looked after also put him towards the back. Kai would have finished with Team Ready go but disappeared within sight of Newcastle baths, meaning the clock kept ticking. His disappearance was interpreted by the ride organisers as an attempt to avoid being nominated for last arrival or even for other awards so we left the clock ticking, current presumed riding time is now 168 hours plus. This years award for camaraderie goes to someone who goes to enormous efforts to bring good spirits to their riding and is a huge motivator and supporter for others cycling. In past years this award has gone to riders who have helped others in a moment of low spirits, with mechanicals, crashes or other disasters. But this year we wanted to take a back step and reward someone who does the hard yards week in week out motivating others to ride and breaking down barriers to involvement in the cycling community. Jullietta Jung has for the last several years organised a sizeable contingent of riders to take on the Newcastle Overnight. Partially as a logical flow on from her work with Sydney Night Rides, and partly just from her normal enthusiasm for all things cycling. This welcoming and encouraging group are always a pleasure to see on the Newcastle Overnight, playing music and looking out for each other. After volunteering at a Tea Stop last year, Jules was riding again this year and is very deserving of the award. Sean for fixing a fellow riders gear shifting problems right after stopping to fix his own flat when he probably just wanted to put his head down and catch up with other riders. Josh for fixing another riders stripped crank with a brand new crank in the nick of time at 8pm on the Saturday night. And thats a wrap for this year, look forward to seeing you all next year ! scroll down below for the link ! weather forecast is good, light winds, no rain…. A week to go ! Yes Sat 11 Nov is the day. monkeysee is offering all ride participants a 15% discount on all monkeysee products including the monkeysee harness and monkeysee elasticated belt. To claim your discount use the promo code NEWCASTLE at the checkout. we will also have some reflective gear available to buy at the start ! 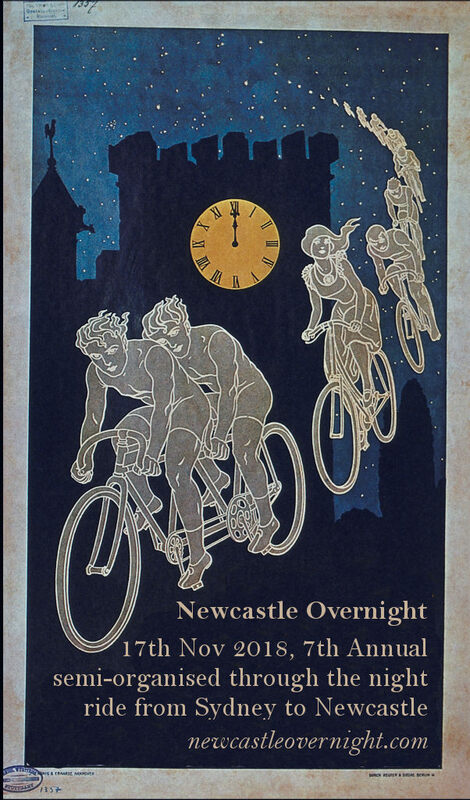 Just a reminder of a few things in the lead up to what will hopefully be a glorious sixth edition of the annual Newcastle Overnight ride. 1: Make sure you register over at the Audax Australia site. 2:Make sure you are familiar with the lighting requirements. We can’t sign you in on the night unless you meet the requirements. 2 independent front lights, 2 independent rear lights, reflector attached to bike, and a hi vis jacket or Gillet. 3: Pre dinner is on again at the lovely York Lane Bar. Its really hard signing in 300+ in the dark at Observatory Hill so come down to York Lane and avoid the crush. York Lane will be serving beer and coffee as well as other drinks and pasta. If you are planning on coming for a spot of dinner, take the time to TXT Dieter on 0415 236 351 so we have a rough guide on how much food to make. 4: We have a generous array of prizes from our sponsors up for grabs. Prize categories are: Most inappropriate bike, Award for camaraderie, and Last arrival.